PrestaShop is a free shopping cart platform that helps small to large businesses create and run a successful online store. It is 100% free. No monthly fees. No commissions on your sales. PrestaShop is available under the Open Software License and was officially launched in August 2007. The software, which is written in PHP and based on the Smarty template engine, is currently used by 165,000 shops worldwide. MySQL is the default database engine. PrestaShop is the winner of the 2010 and 2011 best Open-source Business Application awards. According to W3Techs, PrestaShop is used by 0.5% of all websites. PrestaShop is a web application: It needs to be installed on a web server in order to run, and it needs a domain name that your visitors will use to access your store. Before downloading or installing anything, you need to provide a home for your PrestaShop online store. That is made of two components: a domain name, and a web server. A domain is the online identifier for your website, such as example.com or myonlineshop.net. It is the public face of your web server as well as your store. You need to buy a domain name for your store. You might be able to get one at the same time as you get your web hosting in place: many web hosts offer a free domain with every new account. They might be free for a year, or as long as you are a client of that web host. This makes it easy to get the full package (hosting+domain name) in a go. There are many more. Ask your friends or Search about it on the web! Now that you have a domain name, you need to have it lead to PrestaShop. 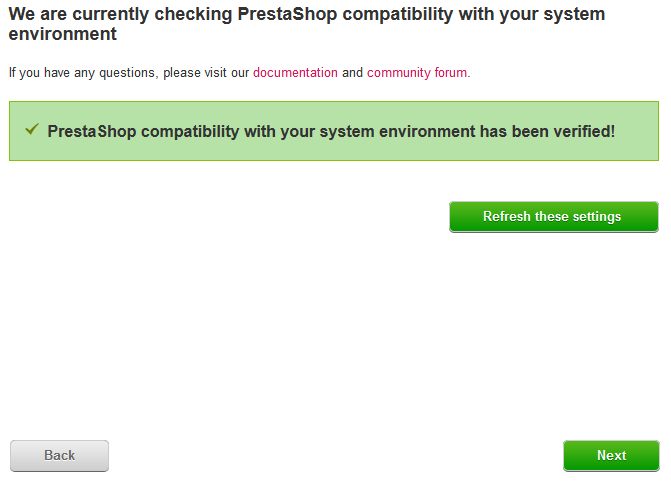 This means that the PrestaShop files need to reside on a web server. You might have a web server of your own, but it is more likely that you have or will have your store hosted by an Internet hosting service (see: http://en.wikipedia.org/wiki/Internet_hosting_service), which provides you with an online home for a monthly or yearly fee. When choosing your host, remember one crucial requirement: it must provide you with support for PHP 5.2 (or more recent), the programming language with which PrestaShop is written, and MySQL 5 (or more recent), the database system where PrestaShop stores all its data. There are many other requirements, for that just check the “Technical requirements” section below. PrestaShop is an application which runs on a web server, and is written using the PHP programming language. It stores its data in a MySQL server. PHP is an open-source programming language, mainly used for web applications. Created in 1995, it has become the most used programming language by web developers. It uses a C-like syntax, making it easy for developers to learn it. MySQL is an open-source database management system. Designed in 1995, it has since then become the most used database system by web developers. It is based on the SQL language, the most widely used database language. System, Unix, Linux or Windows. Unix is highly recommended. Web server, Apache Web server 1.3 or later. PHP 5.2 or later. You may have to activate PHP 5 (ask your hosting provider). At least 64 Mb of RAM on your server. You need two tools: a text editor, for editing text files and a FTP client, fortransferring files from machine to your server and vice-versa. FTP is an abbreviation for “File Transfer Protocol”, meaning the standard way used to transfer files from a computer to a web-host. 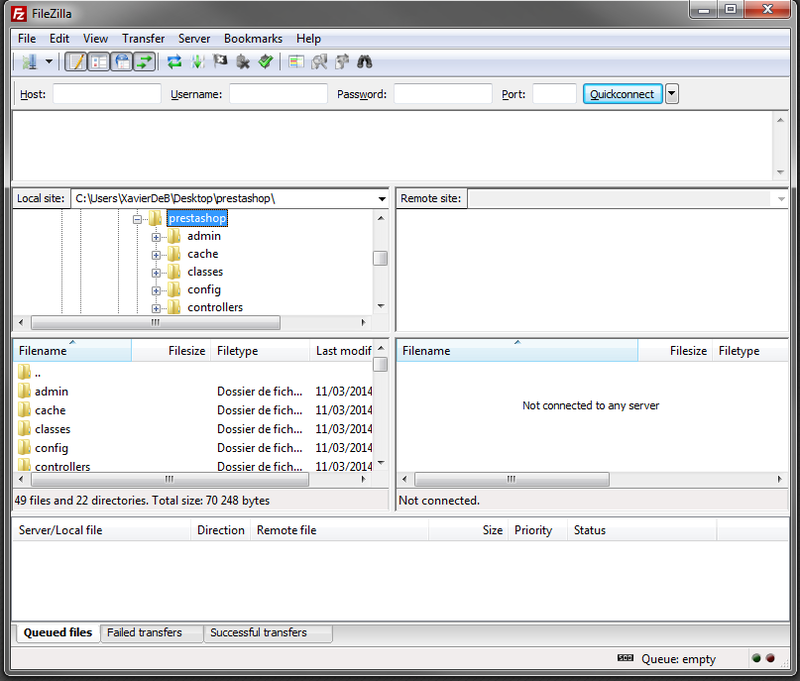 In this tutorial, we will use Filezilla, which is a great and free FTP client for Windows, Mac OS X and Linux. Download it from http://filezilla-project.org/ and start its installation.Note: Do not download FileZilla Server, only FileZilla Client! Once FileZilla is installed, you will have to configure it with the connection parameters for your web server, which should have been sent to you by your host. If not, ask for them to your host – or check your spam folder. A hostname or an IP address, the location of your hosting space’s FTP server. A username, your hosting account identifier, which is unique to you. A password, obligatory security measure. Open the “File” menu, and select the “Site Manager…” option. Click the “New Site” button. A new entry is created in the site list. Give it a recognizable name. On the right side, in the “General” tab, enter the parameters your host provided you with: host, user, and password. You don’t need to change the other default parameters, unless told by your host. Once all the fields are properly filled, click the “Connect” button. This will save your site in the list as well as log you into your account, so that you can make sure everything works right. 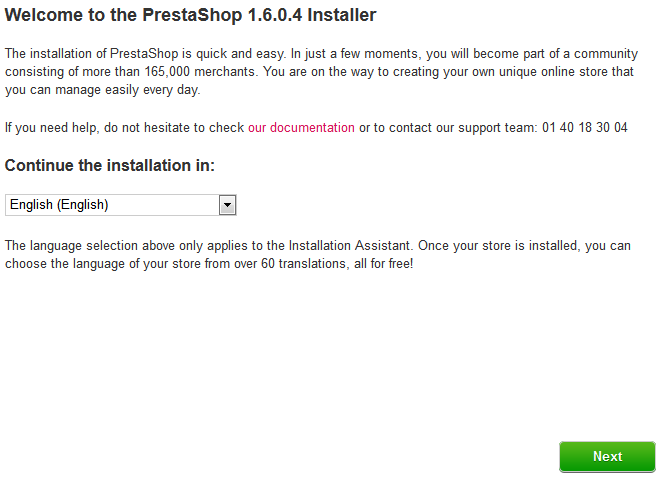 PrestaShop is very easy to install. Once all the files are on your web server, you will be able to configure your shop in not less than 5 minutes in most cases: the installation process is very simple, as the installer takes care of everything for you. Less experienced users might need between 10 and 20 minutes to complete the whole process. Before you get started, make sure you have all the requirements available: server space at a hosting provider, domain name, FTP client, text editor. 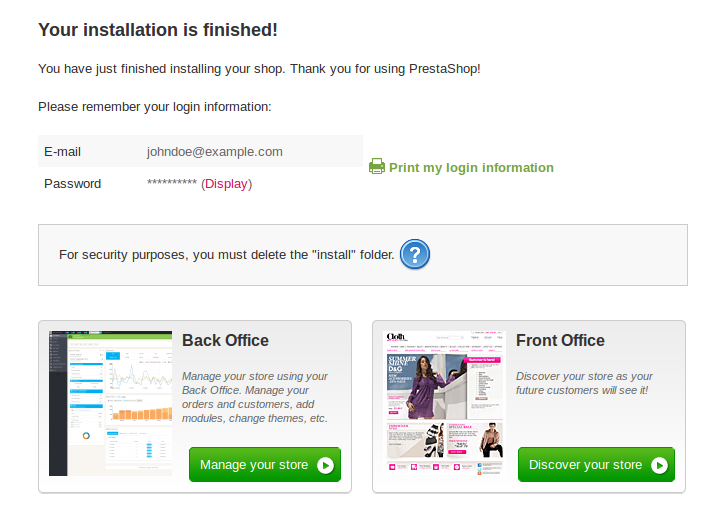 - You can download the latest version of PrestaShop at http://www.prestashop.com/en/download. Click on the “Download” button, and save the archive on your computer (such as on your Desktop). You should get a file named “prestashop_1.6.0.4.zip” (or an equivalent, depending on the version numbers). The downloaded file is a Zip archive, meaning one file containing all of PrestaShop’s files in compressed form. In order to continue with the process, you must uncompress the archive. The “prestashop” folder, which contains all the PrestaShop files that you will soon be uploading on your web server. The “Install_PrestaShop.html” file, which opens this very page in your default browser. The “Install_PrestaShop.html” must not be uploaded on your web server. You should now have a hosting space at your disposal (if not, read the “Getting Started” chapter of this tutorial), and a folder on your hard-drive with the uncompressed PrestaShop archive. 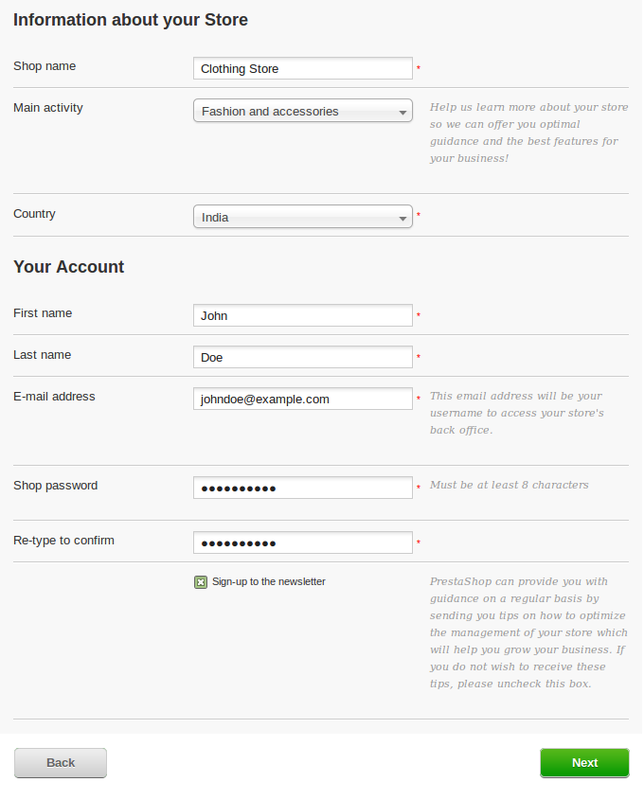 This step makes you upload the PrestaShop files on your hosting space. This is done by connecting your computer to your server using a tool known as a “FTP client”, which you should have installed while reading the “Getting Started” chapter. We will be using the free FileZilla (http://filezilla-project.org/). In FileZilla (or any other FTP client), browse your local folders until you find the one that contains the PrestaShop files. Keep it open in the “Local site” section on the left. Some hosts may require you to place your files in a specific folder, such as /htdocs, /public_html, /web, /www, /yourdomainname.com, etc.Other hosts’ FTP server will simply log you directly into the proper upload space. If you want your shop to be in a sub-folder of your domain name (http://www.example.com/shop), you must first create said folder through FileZilla (right-click and choose “Create directory”), then upload PrestaShop in that folder. If you want your shop to be in a sub-domain of your domain name (http://shop.example.com), you must first create said sub-domain. This depends on your host: you might be able to do it simply by adding a new folder with your FTP client, or you might have to create the sub-domain through your host’s administration panel. Read your host’s support documentation first. Once created, browse to the sub-domain’s folder, and upload PrestaShop there. On FileZilla’s left side, you should now have the local folder where you keep the PrestaShop files from the Zip archive, and on the right side, the destination location. If you haven’t done it yet, uploading is simple: select all files and folders from the local folder (use Ctrl-A), and either drag & drop them to the remote folder, or right-click on the selection and choose “Upload” in the context menu. Uploading can take several minutes, as PrestaShop uses more than 7500 files and almost 1000 folders. 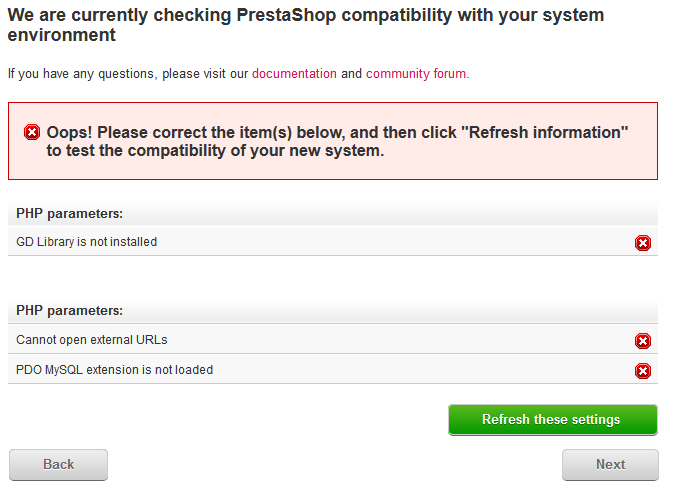 After a while, all of PrestaShop’s files and folders should be online. Great! Before you can actually install PrestaShop, you need to make sure your MySQL server has a database ready for PrestaShop’s data. If not, you must create one. Connect to phpMyAdmin using your account credentials, which your host provided you with. It should be accessible through a standard URL, tied to your domain name, or host’s domain name. In the left column, you can see the databases currently available on your MySQL server. Some of them should be left alone, because they are either used by phpMyAdmin or by the host: phpmyadmin, mysql, information_schema, performance_schema and others. Read your host’s documentation to know if one of these can be used as a default database. Either way, you can create a brand new database by going in the “Database” tab and using the central form named “Create new database”. Simply enter a unique name, and click “Create”. The name of the database will be added to the list on the left. You can now use it to store PrestaShop’s data. 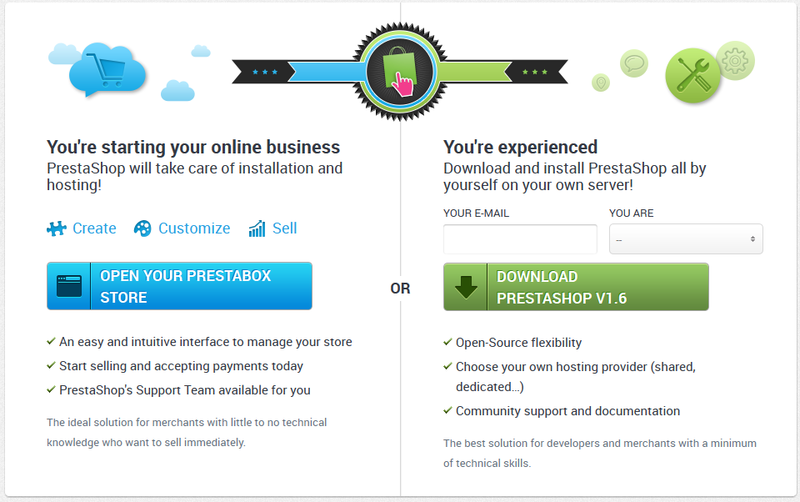 The installation process is quite easy, as it is streamlined with PrestaShop’s auto-installer. You will be able to browse through it in handful of minutes. Do read each page thoroughly so that you do not miss any information. To launch the installer, simply browse to PrestaShop’s location on your web server: the script will automatically detect that PrestaShop is not yet installed, and will take you to the auto-installer. There are 6 steps. At the top of the page, the installation assistant gives you a visualization of where you are in the process: the gray faces turn into smiling faces after each step that is completed. This page is a quick intro of the installation process. You can choose the language in which the installer will display its instructions. Select the language in which you wish the installer to be, then click the “Next” button. This will also set the default language for your PrestaShop installation – but other languages will also be available for you to enable. 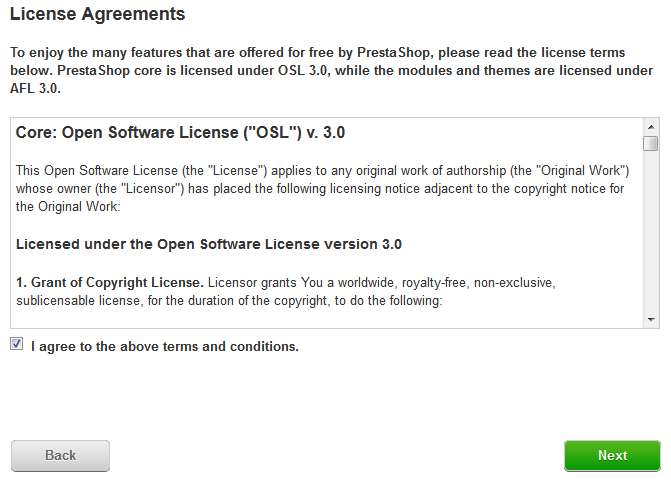 You must agree to both licenses (Open Software License 3.0 for PrestaShop itself and Academic Free License 3.0 for the modules and themes) in order to install PrestaShop. To access the next step, you must check the “I agree to the above terms and conditions” box, then click “Next”. If you do not explicitly agree to the licenses, you cannot install PrestaShop: the “Next” button will not even be clickable. The third page makes a quick check of all the server parameters on your host. In most cases, you will not see this page, because if nothing wrong is found, you are taken directly to the fourth page, “Store information”. If so, you can still go have a look at the third page by clicking on the “System compatibility” link in the left sidebar. If something does go wrong during the server check that happens in the third step, the installer displays the “System compatibility” page, where you can see all the checks that failed. Major errors that come during this step are because of file/folder permission on your server. 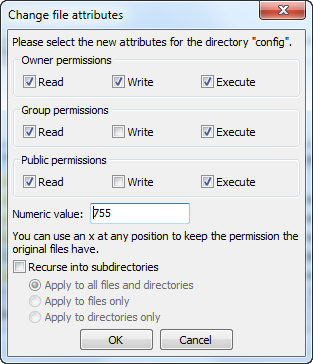 Permissions are the way a filesystem grants access rights to specific users or user groups, controlling their ability to view or make changes to files and folders. The installer needs to make several changes to the files that you uploaded, and if the filesystem does not allow for these changes through proper permissions, then the installer cannot complete its process. Log-in to your server account using your FTP client, browse to PrestaShop’s folder, and find the folders that are marked by the installer as in need of a permission change. Thanks to FileZilla (and most FTP clients), you do not have to use any Unix command. Most FTP clients make it possible to change permissions easily and graphically: once you have found a file or folder that needs such a change, right-click on it, and in the context menu choose “File permissions…”. It will open a small window. Some folders might need to have all their files and sub-folders change permissions too. In that case, check the “Recurse into subdirectories” box. While changing permissions in your FTP client, you should regularly check that you have made the correct changes by running the installer’s compatibility checks again: click the installer’s “Refresh these settings” button as often as necessary. Once all indicators are green, you can click “Next”. If you cannot have them all green, at least make sure the installer displays the “PrestaShop compatibility with your system environment has been verified!” message at the top of the page. This is where you can start customizing your shop: give it a name and a logo, indicate its main activity, and indicate the personal information for the shop owner (which has legal binding in most countries). The hostname of your MySQL server. It can be tied to your domain name (i.e. http://sql.example.com), tied to your web host (i.e.http://mysql2.alwaysdata.com), or simply be an IP address (i.e. 46.105.78.185). The name of the database where you want PrestaShop to store its data. This is either an existing database on your MySQL server, or the one that you created using phpMyAdmin (or any other SQL tool) in the “Creating a database for your shop” section of this guide. The name of the MySQL user that has access to your database. The password of the MySQL user. The database engine is the core of your database server. InnoDB is the default one and you should use it, but the more technical among you might want to choose another engine. Generally, there is no need to change the default setting. The prefix for your database tables. “ps_” is the default, resulting in the PrestaShop SQL tables having names such as “ps_cart” or “ps_wishlist”; but if you need to install more than one instance of PrestaShop on the same database, then you must use a different prefix for each installation. 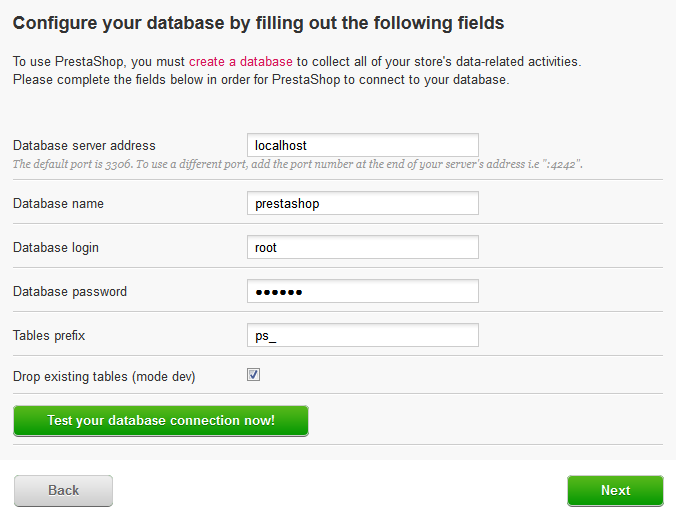 However, we do recommend that you create one database per installation of PrestaShop, if your web host allows it. Better yet: make one installation of PrestaShop, and enable the multistore feature in order to manage many stores from the same PrestaShop back-end. This is only available in “Dev mode”. When re-installing PrestaShop, you can choose to drop the existing PrestaShop database tables in order to start on a clean slate. Click the “Test your database connection now!” button in order to check that you did use the correct server information. Click “Next”: the install will start configuring your shop, creating and populating the database tables, etc. This might take a few minutes: please be patient and do not touch your browser! The “/docs” folder (optional), unless you need to test the import tool with the sample import files that this folder contains. Click on the “Manage your store” button in order to be taken to your administration area. Congratulations! Installation is fully completed now.